Description: An eastbound UP train led by a CSX unit rolls over the bridge crossing the Cimarron River between Kismet and Liberal Kan on the ex Rock Island Golden State route. The historical marker at the parking area refers to it as the "Samson of the Plains" due to its great size. Description: CSXT 7746, 5903, 5930, 5933 & 7592 lead Q135 west at Keystone, PA. Description: Northbound UP goes from the Chester Sub. to the Mt. Vernon Sub at this location. 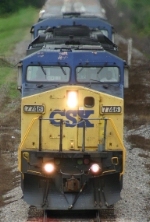 Description: CSX G277. With a backwater pond in the foreground, A N/B grain train passes as the sun finally comes out for good. Description: Northbound autoracks meet southbound autoracs. Description: Heading south toward State Route 105.